To say I was waiting anxiously for this CD to reach the light of day is an understatement. There are a couple of bands that I have been watching closely from the UK which I think would be the perfect sound for the relaunch of the NWOBHM. Between Toledo Steel and Monument (with former White Wizzard members Peter Ellis on vocals and Lewis Stephens on guitar and new bassist Chris Dale from Tank and formerly Bruce Dickinson) to lead the way, the NWONWOBHM is here at last!! Okay that label might be a bit much, but it gets the point across as to what to expect from this band. The guitar tone sounds just like it came off of an early Maiden album and the vocals are just perfectly toned for the music. There have been a lot of bands trying to recapture this sound lately but I don't think anyone has done it quite like Monument. There is also heaping helpings of Saxon as well as some early 70's on here as I sense a hint of early Aerosmith in bits as well! Some of the music contained herein has been released previously on either their Rock The Night EP or their various singles (again a nod to the old school NWOBHM with the singles releases), and there is a lot of really killer tracks that would are perfectly radio friendly yet at the same time really rock out as well! The entire first half of the album is just insanely good. Renegades, Fatal Attack, Crusaders, Runaway and Midnight Queen...seriously I can not pick a favorite amongst them as they all have their own bits of goodness to share!! After the three minute Red Dragon instrumental concludes, the second half of the CD begins and things continue to have their epic sound. Carry On is really a great song and though it may pale slightly compared to the juggernauts in the first half of the album, when Rock The Night hits, things are back to where they began with some incredibly slick music. I haven't even talked about the production, the artwork or anything else, but who needs to as it is all just really well done. A nearly perfect gem shining so brightly! 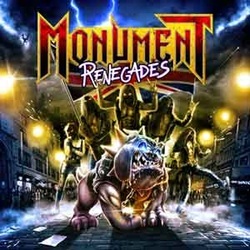 The New Wave Of British Heavy Metal is back and with a release like this may it never go away!